…And Land The High Paying Art Career You’ve Always Dreamed Of. Want to land your dream job? Start here. What I’m about to show you will skyrocket your earning potential and set you up for some of the highest paying jobs in the art world. I’m sure you’re highly focused on imagining what you want in your dream career. I was. I knew exactly what I wanted. Yes. That is part of the equation. Identify your vision and chase the dream. But first, you need to take a step back. Forget for a minute about what you want. This is the first step to landing your dream job. Your future employer doesn’t care about what you want. All he cares about is the quality of talent he can hire. You are directing a massive new project and have $100,000 to hire for a Photoshop position. Three resumes come across your desk. Who do you hire? Recent art school graduate with zero professional experience. A starving “jack of all trades” artist. A true master of Photoshop (with a portfolio to prove it). What you’re about to learn is how to become candidate #3… the most qualified, competent, well rounded, attractive applicant to hire. Even if you want to master a different field in the art industry (like mural painting or illustrations), Photoshop is for you. It will provide the foundational stepping stones to land a killer career and will put you on the path to achieving your dream. Employers are looking for very specific skills to add to their team. Each one of those skillsets has a dollar value applied to it (what they are willing to pay to hire that skill). It’s only obvious to obtain the skills with the highest dollar value, right? Photoshop houses the highest dollar value skills in the digital art industry. So high, in fact, that competitive pay starts at $50/hr. That’s about $100,000 per year. By becoming a master of all Photoshop has to offer, you could land careers in major marketing and advertising agencies, and large company’s art department, or work on your own schedule as a high paid freelancer. Remember what I said before? Everything Photoshop Has To Offer. Employers want to hire a master. They want to assign projects you’ll be able to tackle with confidence and ease… for projects to be done quickly and without supervision. The only way to land a high-paying Photoshop job is to know Photoshop inside and out, and prove it. There’s no better way to prove it than to have an Photoshop portfolio (some pieces you’ll walk away with after this course – more on that later). If you want to learn to cook award winning Mexican food, who do you learn from? An award winning Mexican chef, right? So, if you want to learn to become a professional at Photoshop, who would you want to learn from? Clearly, a well-established Photoshop professional who gets paid for his work. That’s why I hand selected Sycra Yasin to instruct the Ultimate Guide to Photoshop. Sycra Yasin has over 15 years of professional experience as illustrator, storyboard artist, comic book artist, and instructor that gets paid for his art. He has a following on YouTube of about 600,000 subscribers. Sycra has an incredible way of transforming skills into talent… “know how” into results. He’ll teach you all the skills you need to know, and how to apply them to make incredible art. If you want to be a professional at Photoshop, you need to learn from a professional like Sycra Yasin. Valid thought, and I don’t blame you. Afterall, I’m frugal myself and always looking for shortcuts and cost-saving opportunities. Here’s how it will go down. You’ll spend (waste) hundreds of hours scouring videos to filter between good and bad instructors… trying to piece together your own progressive curriculum. You’ll walk away slightly irritated (like I was), and with about 30% of the knowledge that Sycra Yasin will teach you. Those little holes (the 70% you missed) will be your shortfall, and employers will see right through it. Piecemealing is the path that most other artists will be taking… you know… the ones whose resumes you’ll be competing with? A sheep can’t stand apart from other sheeps. Sycra Yasin will teach you step-by-step… skill-by-skill… so you’ll really know the ins and outs of all Photoshop has to offer. Sycra’s curriculum is so in depth that you’ll be learning all Photoshop has to offer by replicating this painting yourself during the course. HINT: This will be a valuable addition to your portfolio at the end of the course. Art school didn’t keep me from becoming Art Director at AAA Games. I couldn’t afford the $40,000 per year tuition and over $150,000 of student loan debt. And boy am I glad I don’t have those soul-crushing monthly payments. All my professional artist friends that did go to art school told me that one valuable piece was missing. They never truly learned how to land a job. They didn’t learn what employers were looking for. That’s why I set out to organize this course. Forget paying over $1,000 per credit. I wanted to create a program that anyone could afford. A program that you could study on your own time, from anywhere, anytime. And, I wanted it to be more powerful than art school. I just downloaded the latest Photoshop User Guide (no joke) and it’s 921 pages long. It’s a list of every single tool or technique that Photoshop is capable of. Seems like a valuable resource at first glance. Each section is broken down into separate themes. It’s completely non-linear. It’s confusing. It’s dense. And it bored me to tears. If you were creating a painting in Photoshop you’d be using tools and techniques in a particular order to complete your painting. But if you were using the Photoshop User Guide, you’d be jumping from one section to the next constantly. It’d take forever. That’s why we created what people are calling the “Missing Manual” of Photoshop. Sycra Yasin will teach you nearly everything you need to know about Photoshop in a sequence that makes sense. Our power-packed video course is practical, easy-to-follow, and will fit into any busy schedule. We’re a hands on learning community, so you’ll all the tools and techniques while you re-create this stunning photorealistic painting. I personally stand behind every class we create. …and we do hear this by the way! That’s why I offer a 100% money back guarantee. If you complete the Ultimate Guide to Photoshop and all the activities and still don’t find value, simply email us, and we’ll cheerfully refund your money. We don’t settle for satisfaction… we want you thrilled. So you can try Ultimate Guide to Photoshop completely risk free. If you’re trying to land the high-paying digital art career you’ve always dreamed of, it’s time to make a choice. #1 Continue piecing together your skills like everyone else (the same people you’re trying to stand apart from). #2 Make the dream a reality by developing the right skillsets the right way. Here’s the good news – I like to differentiate myself just like you’re trying to do. That’s why I priced the Ultimate Guide to Photoshop surprisingly low. If you can afford to buy Photoshop, you can afford this course. When creating the Ultimate Guide to Photoshop, I thought about pricing it at about $600.00 (don’t worry, I didn’t). I figured since it had the power to help someone make over $100,000 per year, it would be well worth the investment (considering a 167x return). Then I took a step back. I realized the pain I felt when I was struggling to get traction in my art career (before I ended up with AAA Games) and committed to helping artists that are going through what I had gone through. It wasn’t about the money. It was about making a difference… about helping people land their dream job… about helping artists get paid to do what they love. So I slashed the price in my head. Then did it again. Then did it one more time. 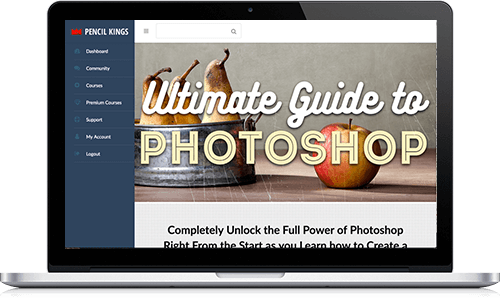 I decided to offer the Ultimate Guide to Photoshop at a price anyone serious about Photoshop could afford. The rock-bottom price I settled on (without it seeming invaluable) was $97.00 – much less than Photoshop itself. If you made it this far, I know you’re serious. I’d like to invite you to take a leap towards the career of your dreams. Does it really cover everything I need to become a master? Yes! We are strong believers in learning by doing, so this course walks you through every function within Photoshop that you'll need to know - as you are making something! Can I really make $50 an hour? Absolutely! We have many students who are working artists, and $50 /hr is a pretty common level for many of them. Freelancing rates can be more than that, depending how you position yourself and bid projects, but salaries can often land in that range. How long can I go back and access the course materials? This course has lifetime access, so you can go back and access our course material as much as you want, for as long as you want. What if I'm not satisfied with the course? If you aren't satisfied with the course, just shoot us an email and we'll gladly refund your course purchase price, no strings attached.